Much of the lesson (Dressage tack, my request) was spent doing spiral ins and outs on a circle until I really had him between my aids, then building the trot or canter on the final circle before heading up the quarter line. 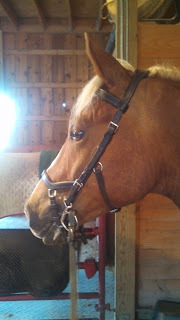 Connor’s response to me asking him to do harder things at the trot is to start cantering, because that’s easier. I am too passive about it, thinking it will go away when he learns to use himself correctly, but my trainer wants to nip it in the bud and swiftly correct him by bringing him down and re-asking using the same aids that prompted the transition. I am completely giving away the outside rein, especially to the left. Elbow goes forward, contact is dropped, and my hand goes up. When I take the outside rein back, he softens. In both directions, he engages the inside hind so much more, especially on small circles, when I am not sitting on it. Duh, Jen. To the left especially, when I remembered to sit on both seatbones evenly and not clamp on with my inflexible left leg, he used the inside hind so well, my trainer was cheering us on almost. The worst part of the lesson was that he was magnificent for the first third, but after a stretchy walk break, he was mentally checked out and done. I tried in vain to get that softness back and couldn’t, and my trainer said I let him walk around with contact but with his nose out far too long. “He knows his job, two strides after you ask him to go back to work, he needs to give it to you. Don’t just keep going with something that isn't working.” That whole time I was pushing various buttons, trying to figure out what I needed to do, but in the end, I just needed to be less of a pushover. RIDE the pony! This is totally off topic but what size is his Micklem bridle? Small horse, and he's on the 2nd to last holes on both the cheekpiece and the jawpiece. I know what you mean about him checking out, my horse Tetley does the same towards the end of the lesson especially lately when it's been so hot here. I also find it hard then to be as forceful as needed as I'm usually tired myself by then and all my strength seems to have left my body notably my legs where I need it most. Yes, totally. It hasn't been hot here at all this summer, but I do find myself tired and not in the mood for his sloth mode at the end of the lesson. There's so much to focus on and think about in Dressage, it's almost as much mental fatigue as physical. From the side view his head could be Comrade's. I have never known two horses so alike even training wise. It is almost spooky. You are having a great run on eye openers. I know! Is Comrade's mane growing in a bit more chestnut? Connor's is. I took that photo because I just love Connor's head in the Micklem, it really flatters his head shape. Comrade and Roscoe both have what I call "chestnut highlights" and they are more at the top. But at 8 Comrade's is still more flaxen then chestnut so I don't worry about him going red. Connor is more pure flaxen then either of the boys so I think it will only be a little bit of added color. I saw a horse in a Micklem at the show. I like the concept, but can't spend to money to try it. It does look good on him. Working correctly is tiring (mentally and physically, as you put it). I wouldn't sweat it if he checks out before the lesson is over. I don't see that as being a pushover either. His endurance will improve with time. Sometimes I don't think I even check in to lessons but it sounds like a really productive lesson! Sounds like you guys are improving, which has to feel great!